Badbury Rings, nr Wimborne Minster, Dorset, United Kingdom. Report 17th June. 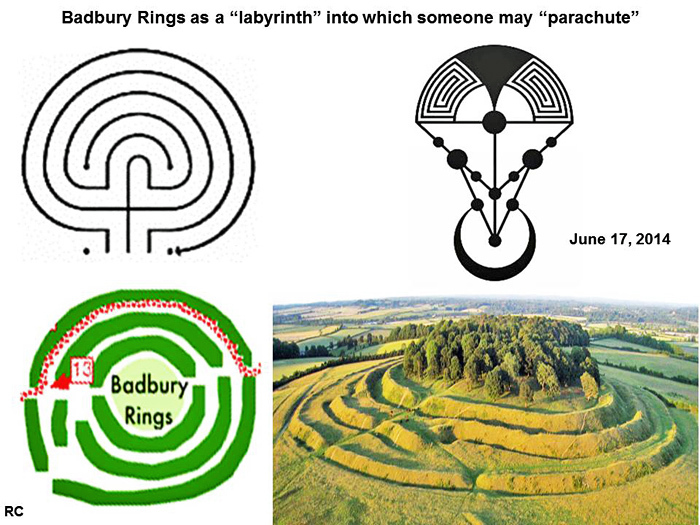 Looking at this very inclusive crop circle, as if the lunar crescent is at the top and the spiral formations at the bottom of the design, it becomes apparent that the Badbury Rings formation is a succinct, complex and profound statement. Not only does it obviously allude to three great world traditions (Norse, Jewish, and Mayan) and their perceptions of the Cosmos, but it also adds the Masonic traditional symbol of the Compass and the Square and a indirect reference to the Eastern Yin Yang symbol to the mixture. Thus it gives us a new message for the future that is well rooted in past world traditions. 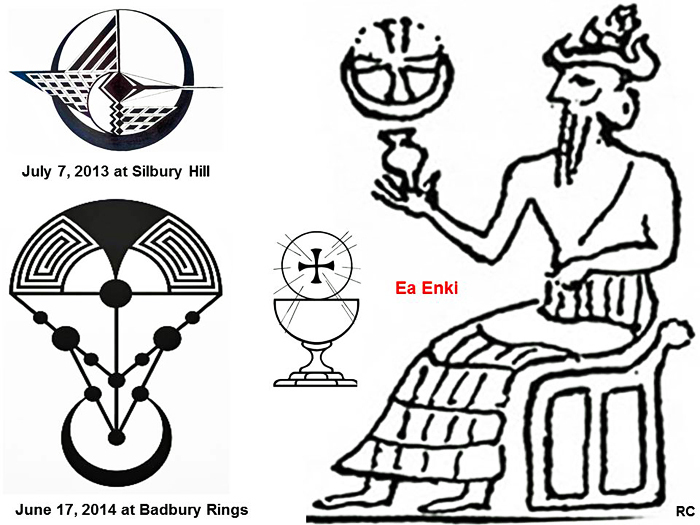 The circlemakers’ technique of combining ancient known symbolism to give us new information and trigger new perceptions makes it seem as if there is an overall plan to which humanity, through time and as material conscious beings, belong. When we look at the design from the lunar crescent down, we see two angular aspects: beginning at the circle inside the lunar crescent, the ‘top’ angle is about 45 degrees whose arms form a ‘compass’; the ‘lower’ angle is about 90 degrees whose arms form a ‘square’ which join and deflect the path of the compass arms so both sets of arms meet together at an outer top point of the square labyrinth spirals. In Blake’s ‘The Ancient of Days Measuring Time’, the Creator measures and orders the Universe. The Compass was a popular symbol for the Creator as divine Architect of the cosmos in the Middle Ages. The meaning of the Compass and the Square in the Masonic tradition credits the compass with spirituality because of its role in drawing a circle; the square is associated with the material world. Both together remind us of the squaring of the circle. Square OVER compass indicates material dominance; compass OVER square indicates the predominance of spiritual principles; the square INTERLACED with the compass indicates the equal importance of the material and the spiritual. The Compass and the Square are symbols of the squaring of the circle, the union of the spirit and matter. In the Badbury Rings formation both instruments are working together as the reverse position of the square indicates. The Action of spirit and matter coincide, and both reach out from the Unconscious (or Unknown), represented by the lunar crescent, towards the labyrinthine symbol of life on Earth. As they do so they pass through the various principles of the Tree of Life in this intriguing crop circle. Eleven circles, large and small, reference the Kabalistic Tree of Life. The circles are positioned differently from the traditional vision of this system of archetypes, and there is one more circle than the ten found in the older versions of the Sephirot. The Norse element to this crop formation will give us an account for why the difference in number of circles. 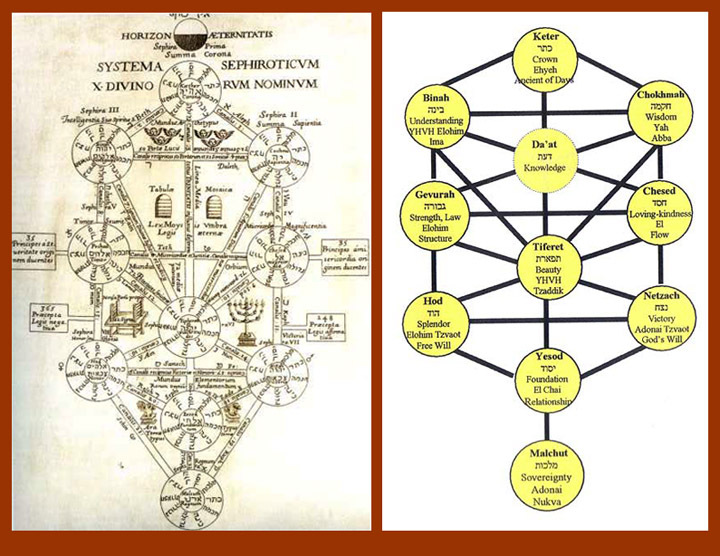 A traditional version of the Kabalistic Tree of Life and a more recent version that has an ‘extra’ sefirah (close to the position of the two tablets in the old version) with the name ‘Knowledge’. In a newer rendition of the Kabalistic Tree of Life a principle ‘Knowledge’ is present where in the older traditional version there is no ‘knowledge’ indicated. The concept of knowledge as one of the sefirah is used at times. In this formation, and with the hint of ‘the horse of Odin’, the ‘knowledge’ aspect of the message and its unusual circumstances may be solved. 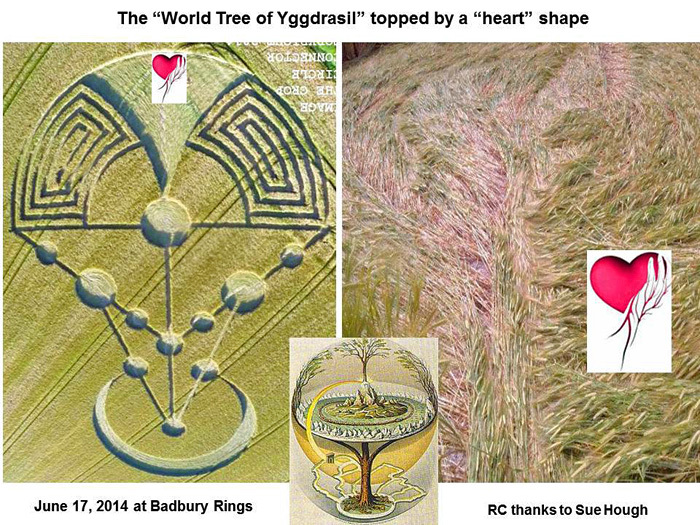 When the crop formation image is viewed to have the ‘parachute’, as RC has named it, opening above, we have a reference to the Great Norse Tree of Life called Yggdrasil–the traditional Norse image of the Cosmos–including all the levels or worlds that exist within it and how some levels relate to the others. The idea of ‘the horse of Odin’ is crucial to the meaning of the whole symbol before our eyes and ties all the traditional meanings found in this formation together. Like the shamans of Siberia and perhaps Northern Europe of long ago, the vehicle by which the shaman entered the ‘otherworld’ was called a horse. In Siberia the horse was a drum as we see time and again in Kandinsky’s early paintings that allude to his identification with the shaman. The trance into which a shaman enters is like a ‘death’, therefore, Odin, in order to acquire certain knowledge, allowed himself to be hanged for nine days from Yggdrasil. Usually the knowledge sought by the shaman is one of spiritual truth, knowledge of the secrets of the Universe. The price one must pay is the ‘death’ of the conscious life and a journey into the unconscious, the unknown. That is the shamanic way to learning, changing, preparing for the new cycle of life to come. Nine represents a complete cycle, attainment, fulfillment, beginning and end. “Odin/Woden hung for nine days and nights on the Yggdrasil to win the secrets of wisdom for mankind.” (Cooper 119) His yielding to the Unknown (‘dying’) is the action that places the factor of ‘Knowledge’ into the Kabalistic Tree of Life. Perhaps that is why it is not always present in the Kabalistic Tree image. Could the message of this crop formation be telling us that to do the same, perhaps in a less dramatic way than actually dying, might be a worthwhile path to take? Would it be stretching it too much to say that at least the acknowledgement that there is more to things than what they seem and that there is an ‘under and/or over current’ of energy that is essential in each of our lives and in LIFE? 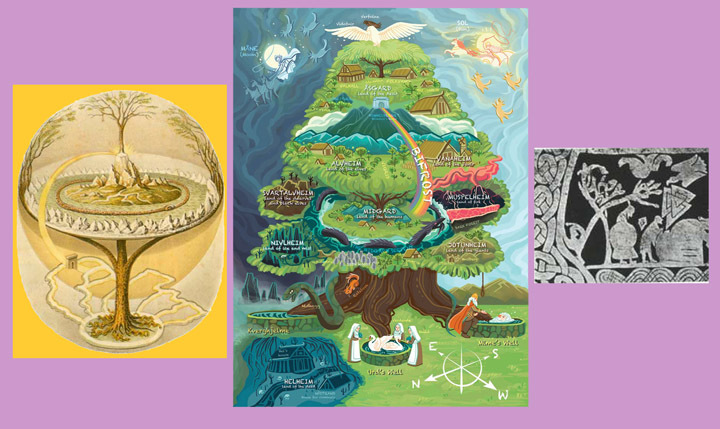 Yggdrasil is the image of Norse cosmology. Midgard, or Middle Earth is Earth with the ourobouros of cyclic natural life surrounding it. Odin hung himself for nine days on the Great Tree of Life in order to experience a shamanic journey. Another image that could be related to the ‘umbrella’ or ‘parachute’ is the mushroom that also ties into the idea of the hanging Odin and his horse, just as it could be associated with the two square spirals representing the two hemispheres of the human brain, united by the ‘corpus callosum’ of the triangular area between the spirals. Another association with the spirals is the Yin Yang symbol of the East that implies opposite energies working together to create Life and to support consciousness. Mushrooms are traditional vehicles for altering consciousness in many cultures including Siberian, Alaskan, Mexican and Central American. 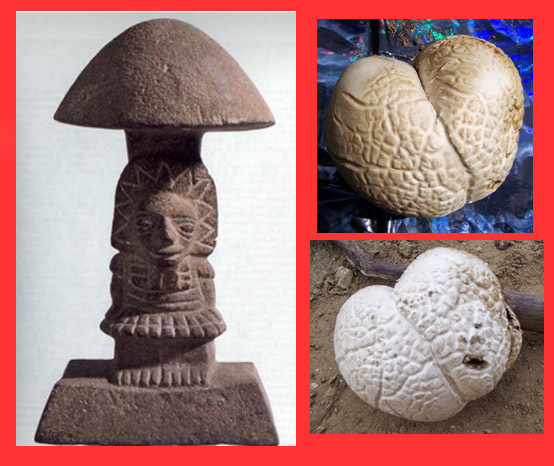 Mushroom stones (as above, left) were probably used in the ancient cults related to the mushroom. Some mushrooms LOOK like human brains! Because of the known effect of certain mushrooms on the human consciousness, the mushroom aspect of this formation may be reinforcing the idea that safety (of a ‘parachute’) and protection (of an ‘umbrella’) may come from within our own minds and how we use them to relate to the world and the changes occurring around us. The predominant direction for this way of dealing with the world is reflected in the opposing spiral designs, both complementing one another in the overall picture. They are reminiscent of the Yin Yang that also depicts the action and interaction of opposite energies working in balance. This is the alternate consciousness that is needed. All the elements and systems referred to in this design are shown interrelated and interlaced to make one exquisite NEW pattern. The ‘Consciousness’ circle close to the ‘human brain’ in the formation has a direct line of communication with the apexes of the square and the compass that operate between the lunar ‘Unconscious’ and the mushroom/parachute/brain ‘Living Consciousness’; there is a back an forth possibility here. In fact, considering the cosmological and ideological references in this grand formation at Badbury Rings, one might say that we are being given a plan for the arrival and activation of COSMIC CONSCIOUSNESS ON THE EARTH!! 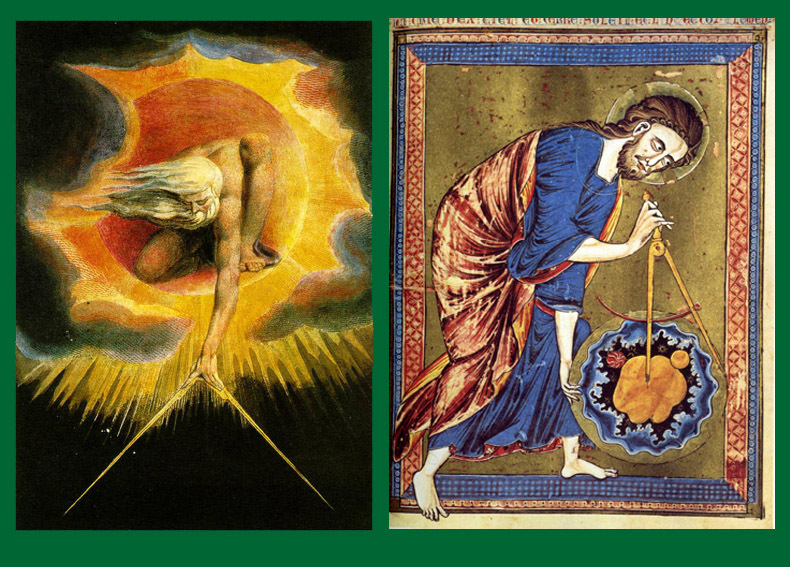 The Book of Symbols: Reflections on Archetypal Images. Kathleen Martin, ed. Taschen. Cologne. 2010. Bruce-Mitford, Miranda. The Illustrated Book of Signs & Symbols. Reader’s Digest. Montreal. 1966. De Vries, Ad. Dictionary of Symbols and Imagery.North-Holland Publishing Co. Amsterdam. 1974. Encyclopédie des symboles. Michel Cazenave, red. Le Livre de Poche. 1996. Purce, Jill. The Mystic Spiral: Journey of the Soul. Thames & Hudson. London. 1974.